Afford Yourself The Perfectly Groomed Beard You Deserve - Starting Today! Well, this beard shaper template tool may just be exactly what you need! Kiss your barber goodbye -figuratively speaking, of course; with this great men's grooming guide tool you can give yourself a professional level trim or a crisp-looking shave! Just place it on your face in the desired position and use its specially designed lines and curves as a template. It's made to be see-through, so it's easy! Shave or trim your facial hair using your razor, trimmer or clipper of choice, and voila! Perfectly shaped and well-groomed masculine facial hair! A Thoughtful Gift Every Gentleman Would Greatly Appreciate. 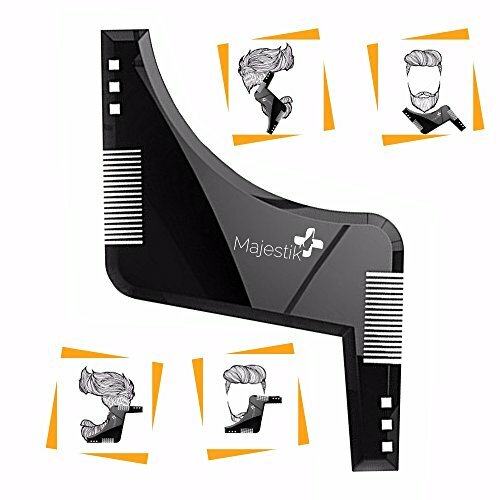 Even if you do not sport a beard or moustache yourself, the Beard Shaper style and shape template tool makes for a great present any man would appreciate. So order one for your father, brother, husband, friend, or any other gentleman you'd like to give a gift to! SCROLL BACK UP AND CLICK "ADD TO CART" WHILE SUPPLIES LAST!